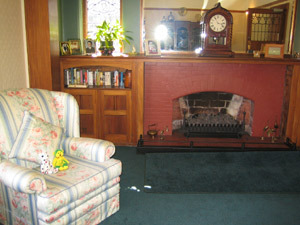 This is the Bed and Breakfast where we stayed in Christchurch, New Zealand. 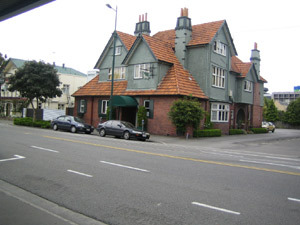 A Bed and Breakfast is a home that has been turned into a hotel. We got in at 2:00 am and were really tired. After a quick bath, we were asleep! We took this photo the next day. It was good to see darkness again. It was always light while we were in Antarctica. If you aren't sure why it was light all the time in the summer there, you might want to read this explanation and Remember that Antarctica is in the Southern Hemisphere. You can also watch this Seasonal Cycle animation to learn more. Stop the animation in different months and look at the pictures at the bottom to see where it is dark and where it is light. Then look at the tilt of the earth in the animation to see why. The next morning we had a really good breakfast. The bacon was different than I was used to - it was more like ham. OzGold says this is how bacon looks in Australia too. We are all packed up and ready to travel. Kind of wish we could stay longer, this is a really nice Bed and Breakfast. We walked to a park a few blocks away. 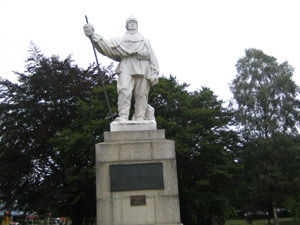 There was a statue of Robert Falcon Scott who is very famous for his expedition to the South Pole. He and several members of his expedition died on the way back because of the cold and hunger. His wife carved this very beautiful statue of white marble as a memorial to him. It was good to see it and to be reminded about how hard it was for the first Antarctic explorers. We walked back and checked out of the Bed and Breakfast. We had to check out a few hours before our plane left, but they let us leave our luggage. So we decided to take a taxi for one last visit to the Antarctic Center. We waited for the taxi in the living room of our Bed and Breakfast, where we almost fell asleep. Here we are at a display in the Antarctic Center lobby where we are standing on the North and South Poles. 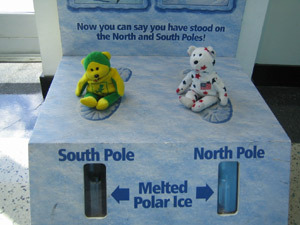 There are two vials of water and each holds water melted from ice at one of the Poles. We thought that was neat. After walking around, buying a few souvenirs and having lunch at the Antarctic Center, we got our luggage and headed out to the airport. 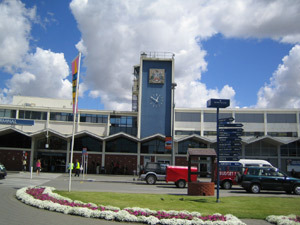 This is the outside of the Christchurch airport. This is the waiting room for our flight. 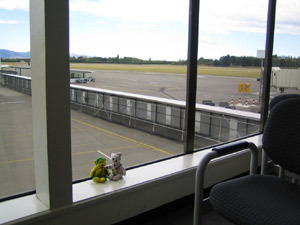 When we get on our plane we are just going to rest. So we will say goodbye now. Thanks for joining us on our adventures.